Like a doughnut, but better. These fritters are less fussy to make, wonderfully chewy and flavorful—and they have a Jewish-Italian connection that I love. Plus, most fittingly for this year of holiday overlaps, in Italy, similar versions are enjoyed for both Hanukkah and Christmas celebrations. 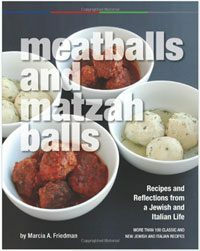 In a new piece for Jewish Food Experience (read it with my recipe—which I’m honored to have included in JFE’s “Top 8 Recipes for Chanukah 2016”!—here), I explore this further. And this festive treat is perfect not only for Christmas/Hanukkah but also, in a different way, for the last night of Hanukkah, which falls on New Year’s Eve. The honey coating, which is symbolic for Rosh Hashanah as a wish for a sweet new year, makes a fine sentiment for the beginning of the calendar year as well. My updated recipe for these fritters stars dried figs and a Sambuca-spiked honey coating. Below are a few pics and highlights of some of the steps of the recipe, followed by the recipe. 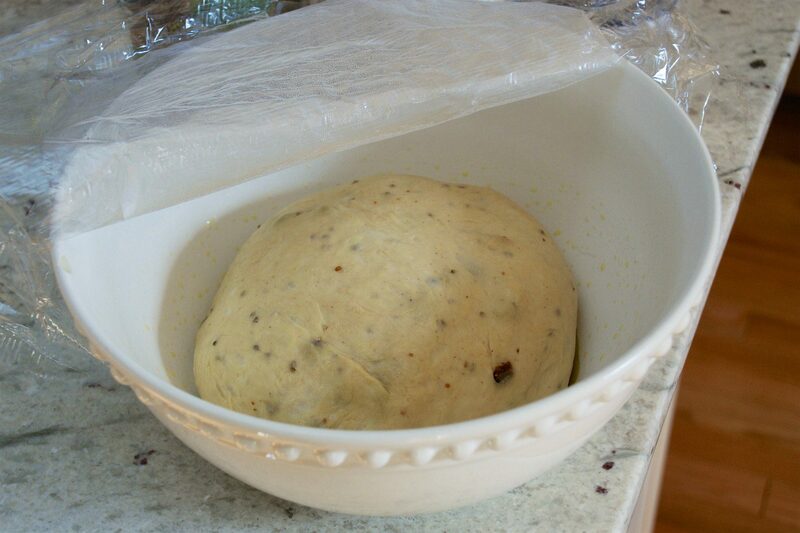 Make the yeasted dough the night below and allow it to rise overnight in the refrigerator. Then you can work with it whenever you are ready the next day. Make sure you get clean cuts, though, so the shapes will pull apart when ready to fry. The oil should be about 375 degrees. The fritters fry quickly, so have a paper-towel lined plate standing by. Almost as soon as you drop the last one in, the first ones you put in will be golden brown on the bottom and ready to turn. Tongs are handy for this job. The nice part of the quick frying is that you don’t spend all that much time dealing with the hot oil. For the coating, heat the honey to a low boil. Add Sambuca (the Sambuca flavor really elevates these but you can of course omit it if you prefer and just use the warmed honey). That’s it! You can drizzle the honey on the warm fritters or gently toss them in the honey if you prefer a heavier coating. 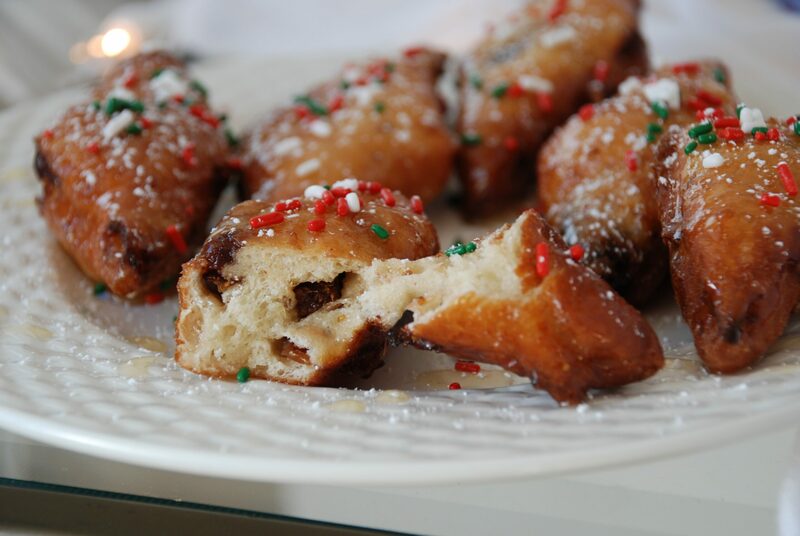 The fritters look nice with a dusting of confectioners’ sugar or, if you like colored sprinkles, a light sprinkle of those can be very festive. Enjoy them warm. If you need to make them a little in advance, place the fried fritters on a baking rack positioned over a baking sheet and keep warm in a 200-degree oven. When ready to serve, add the honey and any decorative topping. At Hanukkah time in Italy, there aren’t many potato latkes. 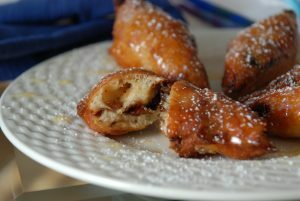 But there are fritters of all kinds, and a bread-like fritter with anise, olive oil, and dried fruit and honey is one of the Jewish-Italian classics. It’s easy to see why, especially with this updated version featuring sweet figs along with the little anise seeds that burst into flavor. The Sambuca in the honey gives a hint of warm spicy fragrance and delicate anise flavor. If you like, sprinkles in the colors of Italy’s flag (red, green, and white) are a festive touch. The fritters taste best (and the dough is easier to work with) if you let it rise overnight or 24 hours in the refrigerator. In a large bowl, combine the milk with the yeast, and let the mixture stand until yeast is dissolved, about 5 minutes. Meanwhile, coat another large bowl with olive oil and set aside. Add the salt, anise seeds, vanilla, oil, honey, cinnamon, and 2 cups of the flour to the yeast mixture and combine well. Gradually stir in additional flour as needed to make a soft dough. Transfer to a lightly floured surface and knead until smooth and elastic, 5 to 6 minutes. Knead in the figs in 3 or 4 additions. Shape the dough in a ball and place in the bowl coated with olive oil. Lift the dough out, turn it over, and place the un-oiled side down in the bowl. Cover the bowl with plastic wrap and refrigerate overnight. 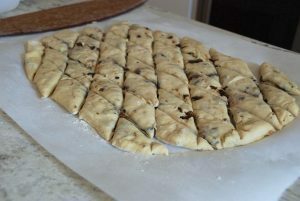 The next day, about 15 minutes before you are ready to work with it, remove the dough from the refrigerator. Press down on the plastic wrap to compress the dough and let it rest covered, 15 minutes. Tear off a large sheet of parchment paper and lightly dust with flour. 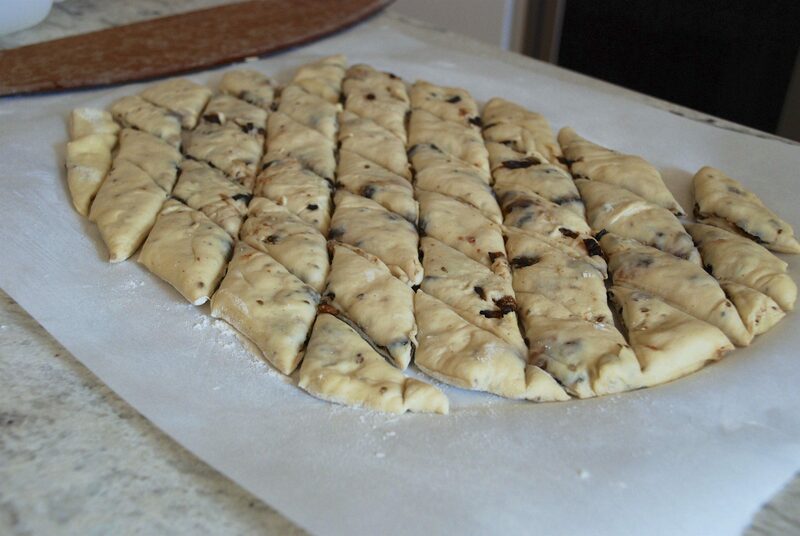 Place the dough on the parchment and press or roll it into a ½-inch thick rectangle, roughly 9-by-15 inches. 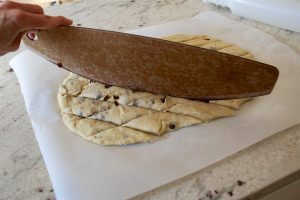 Using a pizza cutter or very sharp knife, cut the dough into approximately 1- to 1½ -inch-wide strips, then cut diagonally across them to make diamond shapes (squares or cookie cutter shapes are fine, too). Cover with oiled plastic wrap and let rest 35 to 40 minutes. After about 20 minutes, add oil to a large deep-sided pan to a depth of about 1½ inches. Warm it over medium heat to 375 degrees. Working in batches so as not to crowd to the pan, drop the dough shapes into the hot oil. 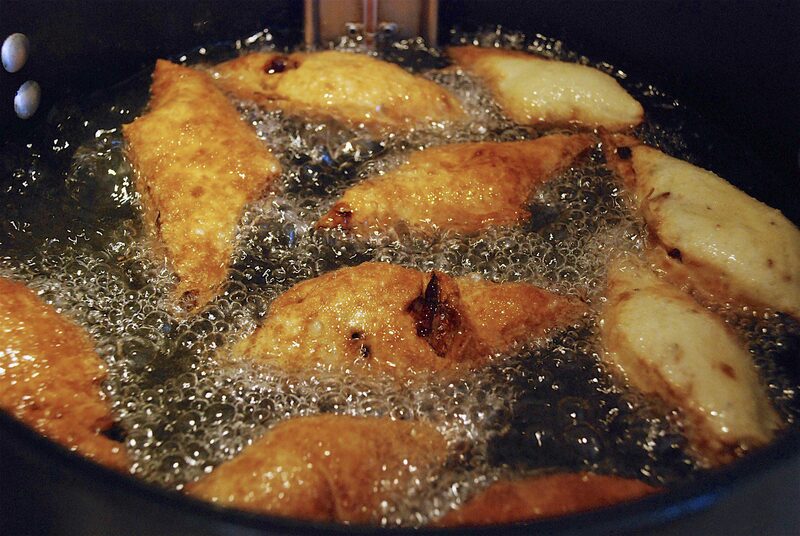 When the bottoms turn light golden brown (after 20-40 seconds), turn fritters over with tongs or a slotted spoon to brown other side (another 30 seconds or so). Remove to a paper-towel lined plate to drain. Repeat with remaining fritters. 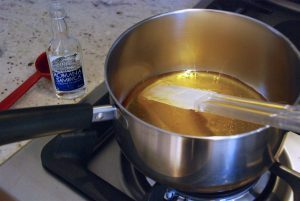 Add the honey to a saucepan and heat to a low boil. Reduce heat and cook another minute. 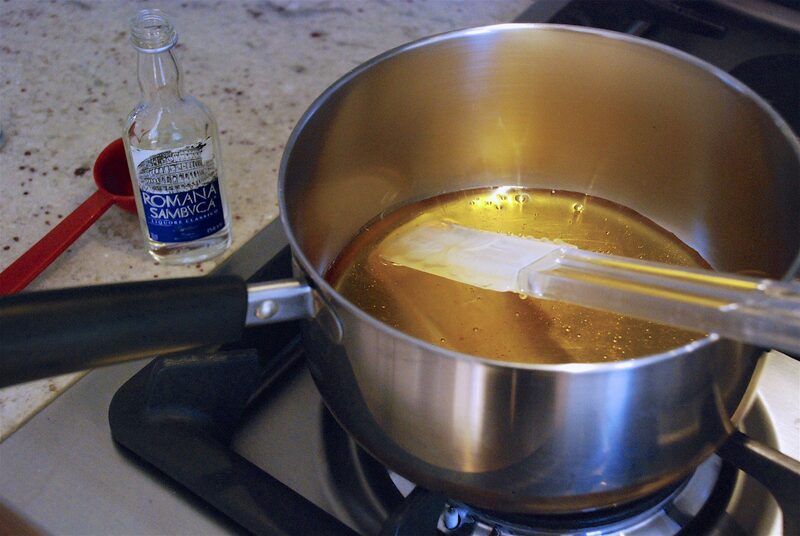 Remove from heat and stir in the Sambuca. Place the fritters on a platter and liberally drizzle the honey over them (or, alternatively, put them in a wide shallow bowl and toss with honey to coat all over). If desired, sprinkle with confectioners’ sugar and colorful sprinkles. Serve hot or warm.